Exterior of the El Patrimonio Apartments in Mission, one of the properties cited in the lawsuit. McALLEN — A Mission man claims he was fined $250 by his apartment complex management because an adult other than himself was watching his children outside his unit. This and other similar complaints made by Robert Padgett, a resident of the Rio Grande Valley, and at least one woman from San Antonio, resulted in a federal lawsuit earlier this week accusing the property management companies that own the apartment complexes of discriminating against people with children. On May 2, the Fair Housing Council of Greater San Antonio, who according to its website, operates as a nonprofit private corporation, “dedicated to promoting fair housing and eliminating discriminatory housing practices in the areas of rental housing, real estate sales, mortgage lending, and homeowners’ insurance,” sued the owners of the apartments alleging they discriminated against Padgett and Lisa Arellano, by enforcing rules and handing out fines to renters with children, the lawsuit states. The civil suit filed in the Western District of Texas, San Antonio Division names Texas Regional Asset Management LLC; Vesta Corporation d/b/a First Vesta Corporation; who manage the El Patrimonio Apartments LP; and Gates of Capernum Apartments LP as defendants. Calls for comment made to numbers listed for Texas Regional Asset Management LLC and Vesta Corporation d/b/a First Vesta Corporation went unreturned as of press time. The suit claims the management companies enforced rules that don’t allow children in any area on their properties without a parent, at any time and under any circumstance. Due to the management companies’ rules, the plaintiffs claim that children are also prohibited from being outside the unit after 8 p.m., regardless if parents are with them, the suit states. “Further, children at Defendants’ properties cannot use or play with bicycles, scooters, skateboards, sidewalk chalk, balls, or play or gather at all in common areas. The purpose and effect of Defendants’ policies are to discourage children from taking advantage of the privileges of the housing that are readily available to other residents,” the lawsuit reads. 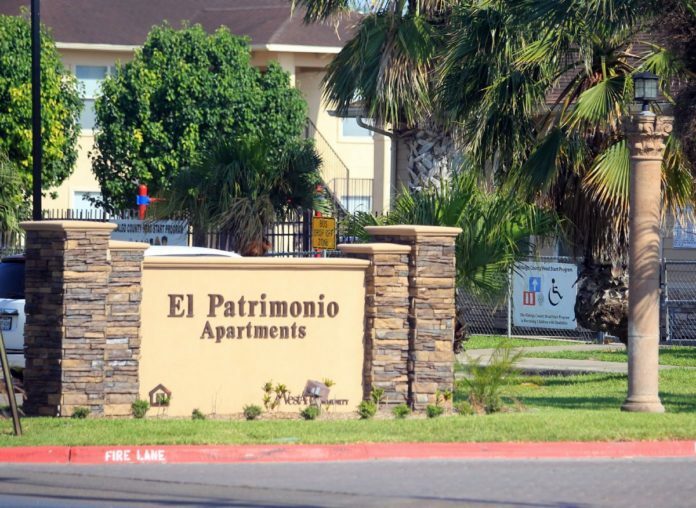 Families who break the rules concerning children have been subject to fines, including Padgett, who was fined $250 by the management at the El Patrimonio Apartments in McAllen because they alleged Padgett’s children were playing outside his unit unsupervised. Padgett said an adult was supervising the children the night in question. The management company, Texas Regional Asset Management, told Padgett he was being fined because the children could only be with a supervised by a parent, and not some other adult. “Defendants informed Mr. Padgett that his children could only be outside with a parent, not just any adult, and that he would be evicted for any further violations of this policy,” the suit states. Padgett, who paid the fine under protest, subsequently moved away from the El Patrimonio Apartments, the court record shows. In addition to the El Patrimonio Apartments, Texas Regional also manages Padre de Vida Apartments in McAllen, Island Palms Apartments and The Galilean Apartments in Edinburg, La Estancia Apartments in Weslaco, Amistad Apartments in Donna, El Pueblo Dorado Apartments in Pharr, La Herencia Apartments in Mercedes, Pueblo De Paz, Rio De Vida, and Vida Que Canta Apartments in Mission, the lawsuit states. Arellano, who lived in the Gates of Capernum Apartments in San Antonio, managed by Texas Regional, and subsequently Vesta, was also reprimanded for breaking rules at the complex. “Defendants threatened to evict Ms. Arellano because she violated Defendants’ strict curfew for children by barbecuing on her patio with her children at or around 8:30 p.m. Like Mr. Padgett, Ms. Arellano left Defendants’ property because of Defendants’ discrimination,” the suit states. The nonprofit became involved after hearing similar complaints from other former and current renters who lived at properties owned by the defendants. “FHCOGSA’s investigation confirmed that Defendants routinely impose conditions upon families with children designed to make common areas, amenities, and other areas of Defendants’ rental properties unavailable to them and to deny residents with children various privileges associated with their rental housing,” the lawsuit states. The plaintiffs are asking for the court to enter a permanent injunction directing the defendants, their agents and employees to take all affirmative steps necessary to remedy the effects of the illegal, discriminatory conduct described herein and to prevent similar occurrences in the future, the suit states. Plaintiffs are seeking to be awarded compensatory, punitive damages, as well as reasonable “attorneys’ fees and costs,” the suit states. In a news release regarding the lawsuit from the FHCOGSA, the group’s executive director, Sandra Tamez, said the suit was filed to continue defending families and children against housing discrimination. “We have filed this lawsuit to ensure that families with children have an equal right and opportunity to use and enjoy housing in South Texas,” Tamez said in the release.